The Chen style of tai chi is the oldest and parent form of the five main tai chi chuan styles. It is third in terms of worldwide popularity compared to the other main taijiquan styles. 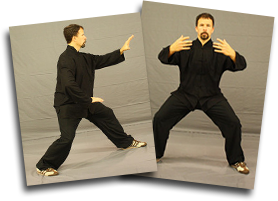 Chen style tai chi is characterized by its lower stances, more explicit Silk reeling (chan si jin), and bursts of power (fa jin). Today Chen style tai chi chuan is practiced for a number of widely varying reasons: health/medical, external/internal martial art skills, aesthetics, meditation, athletic/competition sport (sometimes called “wushu tai chi”). Therefore a teacher’s system, practice and choice of tai chi chuan routines usually emphasize one or more of these characteristics. The five traditional family styles tend to retain the original martial applicability of tai chi teaching methods. Some argue that Chen style tai chi schools succeed in this to a greater degree. The origin and nature of Chen style tai chi is not historically verifiable at all, until around the 1600s when the Chen clan of Chenjiagou (Chen Village), Henan province, China appeared and was identified as possessing a unique martial arts system. How the Chen style tai chi family came to practice their unique style is not clear due to lack of documentation from the formative period and irreconcilable views on the matter. What is known is that the other four modern orthodox family styles of tai chi chuan are traced to the teachings in the Chen family village in the early 19th century. According to interviews with Chen style tai chi family members there was a family art, which Chen Bu (the founder of Chen Jiagou) brought with him. The family had brought this martial art from Shanxi when the clan was forced to leave. While there are few written sources, this history should not be dismissed too quickly because Shanxi is also the traditional origin of Bagua Zhang and H-sing-I Chuan, which share some of the bio-mechanical foundations with Chen style tai chi chuan. Historically documented from the 1600s, the Chen family was originally from Shanxi, Hong Dong. First generation, Chen Pu, shifted from Shanxi to Wen County, Henan Province. Originally known as Chang Yang Cun or Sunshine village, the village grew to include a large number of Chen style tai chi family descendants. Because of the three deep ravines (Gou) beside the village it became to be known as Chen Jia Gou or Chen Family Village. Chen village has since been a center of Chen style tai chi learning. Ninth generation Chen Wangting is credited as performing the first formal codification of Chen style tai chi martial art practice. Perhaps the best known Chen family teacher was 14th generation Chen Changxing (Chén Chángxīng, Ch’en Chang-hsing, 1771-1853). He further synthesized Chen Wangting’s open fist training corpus into two routines that came to be known as “old frame” (lao jia). Chen Changxing, contrary to Chen family tradition, also took the first recorded non-family member as a disciple, Yang Luchan (1820), who went on to develop his own family tradition (Yang style tai chi chuan). Tai chi proved very popular and the other three traditional styles of tai chi chuan further sprang from Yang family tradition; some of these styles also borrowing from the Chen family “Small Frame” tradition. Chen style tai chi family teaching remained hidden and was not taught publicly until 1928. Here at Northwest Internal arts we have been teaching Tai chi for over 20 years. The Chen style tai chi has influenced our program greatly. With the explosive power and strength building exercises from the practice of Chen style tai chi it has helped our students achieve things they did not think they would ever be able to do. Some believe Chen style tai chi is only for the younger practitioners, this is incorrect. You can train the Chen style tai chi very intensely, or as soft as desired slowly building up your strength increasing the power to your comfort level. 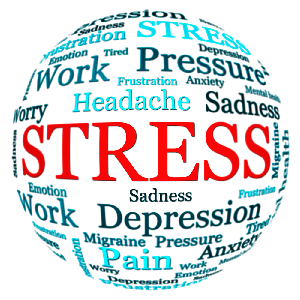 It has a wide practice range to fit the needs of any practitioner. Before teaching the forms, we often may have the student’s do stance training such as Yi chuan (mind fist) and various qigong routines such as silk reeling exercises. These stance training and qigong exercises are done to condition and strengthen the body to have the correct frame and alignment. This is done so as to be able to develop silk reeling energy (Chan Si Jin) before moving to the more complicated movements that are in the forms. Other methods of training for Chen style tai chi include using training aids such as: pole/spear shaking exercises, which teach a practitioner how to extend their silk reeling and fa jing skill into a weapon. In addition to the solo exercises listed above, there are partner exercises known as pushing hands, designed to help students maintain the correct body structure when faced with resistance. 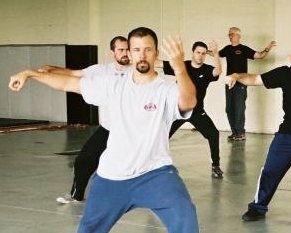 There are five traditional phases of push hands in Chen style tai chi that students may learn before they can move on to a more free-style push hands structure which begins to resemble sparring. In contrast to some tai chi styles and teachers the vast majority of Chen style tai chi players believe that Chen style tai chi is first and foremost a martial art; that a study of the self-defense aspect of tai chi is the best test of a student’s skill and knowledge of the tai chi principles that provide health benefit. In compliance with this principle, all Chen forms retain some degree of overt fa jing expression. This being an important expression for the distinction and beauty of the art is not the most important. Anyone who practices the art should first strive to achieve for health and harmony. One does not have to take it to a competitive level to benefit from the training. In martial application, Chen style tai chi uses a wide variety of techniques, applied with all the extremities, that revolve around the use of the eight gates of tai chi chuan to manifest either kai (expansive power) or he (contracting power) through the physical postures of the Chen forms. The particulars of exterior technique may vary between teachers and forms. In common with all neijia (Internal Martial Art forms), Chen style tai chi aims to develop internal power for the execution of martial techniques, but focuses especially on cultivating fa jing skill. With the Chen style tai chi practice there are 105 basic fa jing methods and 72 basic Chin Na methods present in the forms. Guang Yi, Ren; Stephen Berkwick, Jose Figueroa (2003). Taijiquan: Chen 38 form and applications. 364 Innovation Drive, North Clarendon VT: Tuttle Publishing. Wile, Douglas (1995). Lost T’ai-chi Classics from the Late Ch’ing Dynasty (Chinese Philosophy and Culture). State University of New York Press. Wile, Douglas (1983). Tai Chi Touchstones: Yang Family Secret Transmissions. Sweet Ch’i Press. Gaffney, David (2002). Chen Style Taijiquan: The source of Taiji Boxing. Berkeley, CA: North Atlantic Books. Chen, Zhenglei (2003). Chen Style Taijiquan, Sword and Broadsword. Zhengzhou, China: Tai Chi Centre. i am interested in your chen style classes and would like some information on class schedules and cost. Because we have several different class and pricing packages available, the best way to learn about them is through speaking with one of our instructors. You can call us and we’d be happy to get you an appointment for an introduction and a free 1 hour lesson; our number is 503-740-2666. 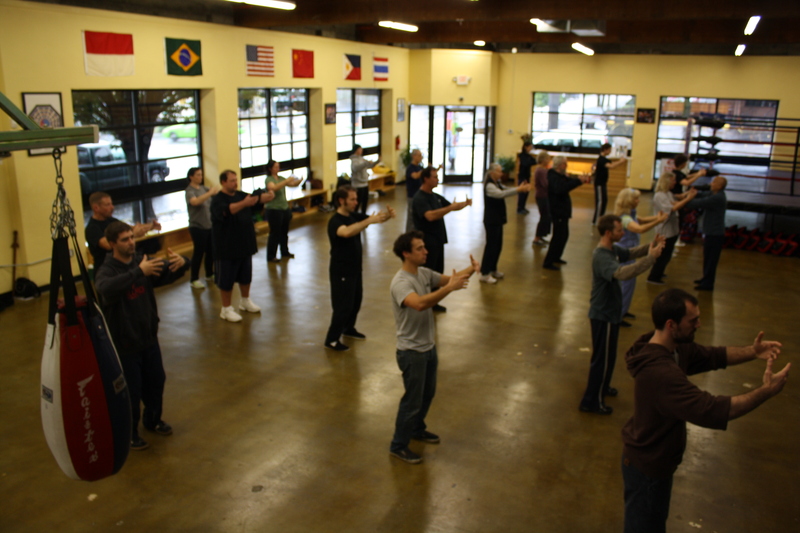 You can also fill out the form on this website (http://portlandtaichiacademy.com/tai-chi-classes-in-portland) and we’ll give you a call. Thanks for the interest! I am very interested in trying a class of chen style taiji. I have some background in taiji, but I’m looking to start from scratch in a school that is local. Can you give me some idea when and how often you meet?